(NEW YORK CITY, September 6, 2018) – GFNY Asia and GFNY Europe Champions were crowned during the past weekend of GFNY Global Marathon Cycling Series. 732 riders from 25 countries around the world took on the GFNY Europe Championship course in Hamelin, Germany on Sunday. It was the 3rd annual running of the event and first as a European Championship. The results saw the championship won by German riders in both the men’s and women’s race. In the men’s race, German rider Jochen Wallenborn took the win in 4:25:17. A little over a minute back a sprint finish decided second place with Nikolaj Hebsgaard of Denmark just edging out 2016 champion Christian Zucker (GER) in a time of 4:26:30 (Hebsgaard) and 4:26:31 (Zucker). The women’s race winner Janine Meyer of Germany had a strong ride powering away from the field taking the win in a time of 4:35:37. Second place was a dead heat tie between Hannah Fandel (GER) and Marion Wittler (GER) in a time of 4:46:59. 400 riders from neighboring Southeast Asia, Australia and European took part in the GFNY Asia Championship. The racecourse circumnavigated the island of Samosir in Lake Toba, world’s largest natural lake occupying the caldera of a supervolcano. Indonesian rider, Aiman Cahyadi won the men’s championship in a time of 4:10:09. Tied for second, fellow Indonesian’s Frederick Murtanu and Taquim shared the podium in a time of 4:12:24. Fresh off a top-10 at the Asia Games, Yanthi Fuchianty from Indonesia won the women’s Championship with a 25minute lead from her fellow riders in a time of 4:39:19. Rohidah (IND) took second in 5:05:00 and rounding out the podium, Noviana (IND) crossed the line in 5:17:44. Finishers in the top 20% of age groups in both the European and the Asian Championship qualify for the championship racer corral at GFNY NYC next May 19th 2019. 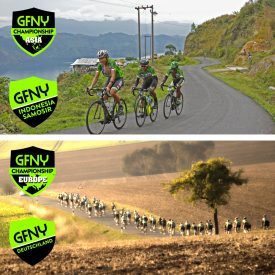 Next up is the inaugural GFNY Portugal on September 9th.